Co-owner Adam Healy climbs at Bloc Yard Bouldering Gym. Climbing as a sport has grown steadily in the U.S. since at least 2009. Competitive climbing has been added to the 2020 Summer Olympics in Tokyo, and last year, 27 new climbing gyms opened across the country. Although that number is down slightly from previous years, new facilities are still popping up all over, and Spokane has followed the trend. In the spring of 2017, Spokane's second indoor climbing gym, BLOC YARD BOULDERING GYM opened, offering climbers a second option to what's been the favorite indoor gym locally — Wild Walls. Adam Healy, one of Bloc Yard's owners, says the new gym offers options for beginners all the way to competition-level climbers. Bloc Yard is a bouldering-only gym. Bouldering, as opposed to other styles of climbing, is done on shorter walls over foam padding, without the use of ropes. The new local gym also has a "cave" where climbers hang almost completely upside down. That's perfect for developing power and endurance, Healy says. • Wild Walls Climbing Gym is often considered the go-to indoor facility, with both roped and bouldering walls available. 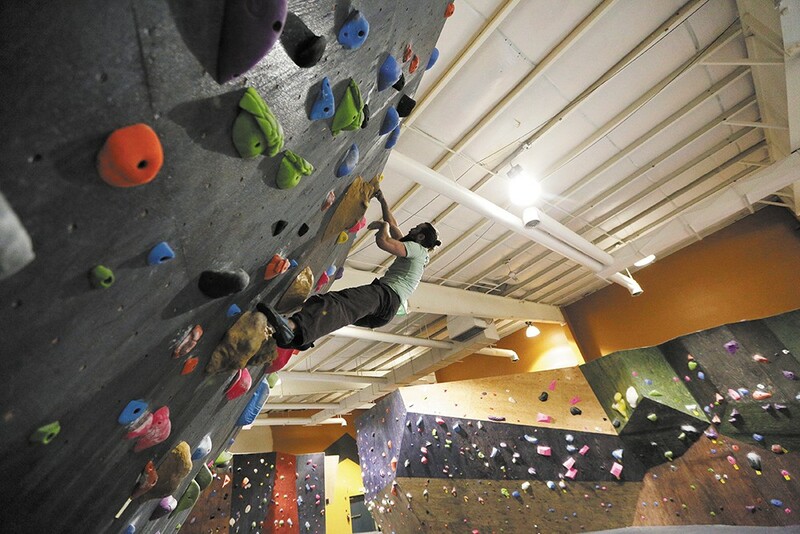 • The EWU EPIC Rock Climbing Wall also offers roped and bouldering problems. Students can climb for free; members of the public can buy a pass. • WSU's climbing wall is located in the Student Recreation Center on Court 7, and is great for beginners and experienced climbers alike. Check out urec.wsu.edu/climbing-wall for open climbing hours and clinics. Located in northeast Spokane off Upriver Drive. One of the area's most popular, especially for bouldering, the main wall is 70 feet with a huge variety of other routes. South of Spokane Valley in the Dishman Hills Conservation Area. Good scenery with more than 60 routes, some of which are kid-friendly. About a 30 minute drive east of Spokane in Post Falls, Idaho. Pronounced "kah-MEE-lin." Rocks made of "less jagged and more fingertip-friendly" granite, with more than 80 routes. Located in Riverside State Park (Discover Pass needed). The area offers a huge variety of climbs in a secluded area. Located in the Spokane Valley. The climbing area has 14 bolted routes. The best route, according to outthreremonthly.com, is "Viva La Revolution," near a waterfall. "This sport route features tough holds with great moves. No single move is difficult, but the whole route is rather pumpy," writes climber Jon Jonckers. • REI hosts free open-climb sessions at its location on North Monroe in Spokane. Everything you need, including instructions by certified staff, is provided. Visit REI.com for specific dates and times. • Wild Walls Climbing Gym offers adult and youth classes and clinics for all skill levels. Group and individual sessions available. Call 455-9596 or email wildwallsgym@gmail.com for more information. • Eastern Washington University has classes for students and the general public. Learn belay certification, lead climbing, rappelling and more. Visit sites.ewu.edu/recreationfacilities/climbing-wall/climbing-wall-classes for more details. • The Spokane Mountaineers offer indoor and outdoor rock climbing schools each year. Check out spokanemountaineers.org/page/rock-school for details on class sessions. Participants will learn proper belay and climbing techniques, how to use anchors to set up a top rope system, how to tie a climbing rope and more. Cost is $50.